Test yourself with our free MAT & QL quick quizzes. Enter your details below to get started. Bridging the gaps between the A levels and NBTs. Ask us about the NBTs.. Currently, the NBTs main website is down. This means you are unable to see the test dates or book your test. We have contacted them and have been told that the website is currently being upgraded and will be available soon. In the meantime, if you have any NBT questions then please read through this page or ask our team who are happy to help. What is the NBT test? The NBT test is a set of tests used to assess a student’s academic literacy, general knowledge, and mathematical skill in an effort to measure academic readiness for university. The NBT test was implemented in 2008 and is a set of tests that assess students’ academic literacy, general knowledge, and mathematical skill in an effort to measure academic readiness for university. The NBT tests are managed by the Alternative Admissions Research Project at the University of Cape Town. NBT results are used by many universities as an extra admission criterion for applicants to their institutions. They serve to complement and support, rather than replace or duplicate NSC results. Dr Abbey Mathekga, the head of the higher education enrolment programme, said: “They [the NBTs] are intended to identify learners who might have problems in certain subjects. They are also aimed at determining the level of competency of learners in certain learning areas.” The NBT consists of two tests: the MAT and the AQL. The AQL (Academic Quantitative Literacy) is one multiple-choice test of three hours writing time. The MAT (Core Maths) is also a multiple-choice test with three hours writing time. Both papers are written on the same day. What are the NBT tests like? The NBTs are multiple choice tests. Both the AQL and MAT test are 3 hours long. Answers are recorded on what is called a “bubble sheet”. The answer sheets are scanned and then transferred into scores using sophisticated computer software. The AQL is made up of 25 minute sections. You may not refer back or go forward but can only work in the specified 25 minute section. The MAT is not made up of sections in this way. Do I need to write the NBT test? Most South African universities require applicants to write the NBT test. So the answer to this question is - it depends on where and what you are applying for, but the most likely answer is, yes! Besides first year applicants, some post-graduate degrees (for example MBA programs) require the NBT as well as certain scenarios where students need to change degrees or universities. So, the NBT is NOT just for first year applicants. You may need to write the AQL and the MAT or just the AQL. Below we have summarised a table of which universities and departments require the NBT. The second table will help you to see whether you need write just the AQL or the AQL and the MAT based on what and where you are studying as well as results to aim for and what dates you need to have written it by. Which Universities require the NBT? *Each institution determines which tests are required i.e the university and faculty where you apply will determine which tests you must write (AQL or MAT, or both). Please check with each institution/faculty where you intend to apply, before you register for the NBTs with regards to their application requirements including closing dates and deadlines for receiving NBT results. Please note that each university has different requirements and each faculty may require different tests or have different deadlines. What does the NBT test entail? The AQL (compulsory for all students who are required to write the NBT) aims to test proficiency in language comprehension as well as logic based numerical skills. It assesses knowledge learned in the senior high school phase. It aims to assess whether students will be able to apply knowledge learnt in high school to the tertiary context. The AQL section comprises approximately 75 multiple-choice questions. The Academic Literacy (AL) sections will require reading of various texts with multiple choice questions referring to the text. Some questions are general knowledge based. Questions on grammar, punctuation, vocabulary are included. It predominantly assesses the ability to understand the meaning and application of various texts as well as understanding and applying the argument or main point of the author. The MAT paper is a separate three hour paper (only written by students applying for certain degree programmes and who have done Core Maths at school) and assesses mostly Grade 11 Core Maths syllabus content although some Grade 12 work is included, depending on the time of year the assessment is written. It also takes a multiple choice format. It tests proficiency in such areas as problem solving and modeling, functions, trigonometry, spatial perception, and probability. Both the AQL and MAT are differentiated into cognitive levels, meaning there is a range in difficulty in each section – with the easier applications generally coming first. How to prepare for the NBT? Trust us, we've been doing this for years. Advantage Learn offers NBT Preparation courses in the form of workshops (book here) and online (book here). Our course is recommended for all students wanting to prepare and do well in their NBT test. With many years experience in preparing students for the NBT test coupled with a world class online learning environment and exceptional educators, we are well placed to give you peace of mind with this challenging test. Our course includes the following: training of essential sections known to be tested regularly in the NBTs, test day best practices, how to go about answering multiple choice questions, extensive practice examples and a full mock exam. NBT Online or NBT Workshops - You choose! Made up of just over 20+ hours of tutorial videos led by our Maths and English experts, the course focuses on covering key concepts tested in the NBT as well as test day best practices. Students have full access to the material from the purchase date for 12 months. Students are able to work at their own pace, at any time of the day, in accordance with their NBT test date. There are teaching videos, practice questions, quizzes, downloadable notes, a mock NBT past paper for the MAT & QL and comments for asking questions directly to the teacher and other students. The more you engage with the material you are watching the better you will do. Press pause, watch again, try the examples on your own and learn at your own pace. You can access the online courses at any time of the day or night - that is the beauty of online learning! Click for our Full Online course or just our AQL course. Access to online course training MAT, AL & QL from prior to the course day for 12months. Click here to view our NBT workshops. We offer our NBT preparation course solution to schools. If you would like to speak to one of our team about these packages then please Email us on info@advantagelearn.com. When should I prepare for the NBTs? It is important to attend an NBT workshop in your Grade 12 year. It does not matter when you attend an NBT workshop. The important thing is to make sure you utilise the online course in the 2 weeks leading up to the NBTs to make sure the content is fresh for when you write the test. If you are a post Matric learner needing to sit the NBT then we highly recommend you re-study your Grade 11 Mathematics before attending a workshop. You can do so through our Maths Online Grade 11 Path. To view our courses click here. The test dates are provided by National Benchmark Test project and are available on their website . You can only book your test from the 1st April, again through their website. To register you need to go to the NBT website. Watch the video below for a helpful walk-through. Does my chosen University require the NBT? Does UKZN require the NBT? Only if you have chosen to study Medicine. All other courses do not require you to have sat the NBT. Does NMMU require the NBT? No, you do not need to sit the NBT if you want to study at NMMU. Does UFS require the NBT? Yes, you need to sit the NBT. You will only need to sit the AQL section for most degrees. Please check with your University Department to check their requirements. Does Stellenbosch require the NBT? Does Tuks require the NBT? Only if you are planning on studying Health and Veterinary Science. For all other departments you do not need to sit it. Does Rhodes require the NBT? Does UCT require the NBT? Does Wits require the NBT? Only if you are planning on studying Health Sciences. For all other departments you do not need to sit it. What if I am applying to two institutions with different application deadlines? If you are applying to more than one institution or faculty then you need to register and write the NBTs to meet the earliest deadline. You are only required to write the test once, even when applying to more than one institution. All institutions to which you apply will be able to access your NBT results. How is the style of the NBT assessment different to assessment styles students are used to? Unlike the US and the UK and many other countries that model their education system around standardised assessments (eg. SATs, ACTs etc) our South African school system more commonly uses summative, continuous and formative styles of assessment. ( for an explanation of these styles read more here). The NBTs are a standardised assessment and thus this form of assessment is not common for many South African students. So how does this form of standardised assessment differ from the usual forms of assessment employed? They are multiple choice based. This is unfamiliar answering territory for many students and so needs practice before-hand in order to build confidence. The questions are formed around right AND wrong answersand not just the correct answers like we are used to. In other words, you will be faced with a situation where you think to yourself, but BOTH A AND B could be right. This can be really scary. At a high school level we are groomed to try to get the CORRECT answer hence questions are formed to lead students to the correct answer. There are no marks for working and hence the questions are formed to test absolute accuracy. This makes it critical to work efficiently and accurately! The order of difficulty does not build through the assessment. The hardest question might be the first question and this often throws students off from the get-go. A one-time assessment! Most students write this assessment once and the results are used for university applications. At school we are used to building our results through many different methods.eg. continuous assessment, outcomes based projects and portfolios of evidence etc. You don’t know ahead of time what is going to be tested - in school you know at least what part of the syllabus is going to be tested. We could go on for ages but I think you get the message, it is very different to what you are used to! The NBTs are available in both Afrikaans and English. When you register, you will have the opportunity to indicate which of these two languages you prefer to write in. NBT results are valid for three intake years. This means that it is worthwhile writing your NBT in your Matric year even if you are having a gap year. Your syllabus will never be more fresh in your mind as it is now. If you cannot write the NBTs in the year before your studies (if, for example, you are overseas), you are allowed to write them in January before the start of the academic year. Bear in mind, however, that you do expose yourself to special risks and practical implications in terms of placement and selection if you write the tests at such a late stage. It is therefore strongly recommended that you write the NBTs in your Matric year. For all and any other enquiries about the writing of your NBTs and release of NBT results contact: NBT Client Services Centre (University of Cape Town). Telephone: 021 650 3523. Website: www.nbt.ac.za. Can I write the NBTs more than once? Some universities do allow their applicants to write the NBT more than once in an attempt to achieve a better result the second time around. However you need to check with the specific faculty and tertiary institution that you are applying to, to make sure that this is the case as not every university will accept the second result. Note If you do choose to write a second time, you should give yourself at least 6 weeks between writing sessions.If you write the MAT test a second time, you must also write the AQL test a second time on the same morning. NBT registration for the 2020 intake opens on 1st April 2019. Follow this link to book your test. Check the following before you book your NBT test! All this needs to be taken into consideration when you are deciding when the best time is to write your NBTs. Registration for the NBTs is done online and takes about 5 minutes. NBT registration for the 2020 intake opens on 1st April 2019. Follow this link to book your test. Note: you will need your official South African ID or foreign passport in order to complete the registration process. Your registration is only valid for the specific date and location you select and must be done at least three weeks before you wish to write. It is your responsibility to register early enough to ensure a place on one of the national test days at your chosen venue. There is a full list of available test days and venues on the NBT website. If you do not have access to the internet or encounter problems during the registration process, you may either call 021-650-3523 or send an e-mail to nbt@uct.ac.za for assistance. NBT Brochure click here for more info. More about the NBTs click here. Book your NBT test click here. NBT test sites click here for more info. To request your NBT Test Scores Log into your NBT account here. University of Cape Town click here for more info. Wits University Click here for more info. Stellenbosch University click here for more info. Rhodes University click here for more info. University of Kwa-Zulu Natal click here for more info. University of Pretoria click here for more info. University of the Free State click here for more info. How do I get my NBT test results? To access your NBT results you need to login to your profile on your NBT page. NBT results are only available four weeks after you have written your test. Click this link to go to the NBT results request page. Didn't get the results that you wanted? We offer a few online courses that will help increase your results. Our NBT Preparation Online Course will help you improve your MAT and AQL results. Our NBT AQL Preparation Online Course will help you improve your AQL results. How much does the NBT cost? Why do I have to register? The NBT project and the local venues guarantee space and materials ONLY for students who have registered to write at a specific venue on a specific day. What dates can I write the NBT? NBT registration for the 2020 intake opens on 1st April 2019. All test dates for the 2020 intake cycle (11 May - 5 January) will be available to book from 1st April. The tests will run on the weekend, every week or every second week from 11 May 2019 - 5 January 2020. What is the full meaning of NBT? NBT stands for National Benchmark Test. This is a examination set up by the National Benchmark Test Project. The exam is designed to test students for University readiness. What languages can I write the NBTs? The NBTs are available in English and Afrikaans. When you register you will be asked to indicate the language in which you wish to write. Note that you can only use one language i.e there is no option to write one test in English and the other in Afrikaans. What time are the NBT tests? The AQL is written in the morning (3 hours writing time), and writers must be at the test venue by 07:30. The MAT is written in the afternoon on the same day, with a short lunch break between the two tests. The MAT also has 3 hours writing time. No learner is allowed to arrive at mid-day to write just the MAT test. If you are writing the MAT test, you must write it on the same day as you write the AQL test. What to bring to the NBT test? NOTE that learners without an official ID will be turned away and not allowed to write (except where the following documentation is provided - a birth certificate with an affidavit from the police including a recent photograph and a letter of application for ID from Home Affairs). What to expect on the NBT test day? YOU MUST CHECK IN AT 7:30AM. The test venue door closes at 8:30 after which no one is allowed inside the test room. When can I write my NBT test? Each university and department will have different requirements for when you need to write your NBT test. Some might be as early as June or July. This is one of the reasons why the NBT is so confusing! Our top piece of advice is to choose a date that fits in with your application requirements AND is at a time when you can give it the attention it deserves (i.e. make sure to check your school calendar to ensure you don’t have other important school events in that week). Available data by the NBT suggests that learners who write the tests later in the year have no advantage over those writing in earlier sessions. The test changes as the year progresses in order to maintain the validity of the test. From Advantage Learn’s experience and certainly our NBT expert and teacher, Mrs Pike, we recommend that students should write this test as early as possible in the year and definitely before trials. The earlier a student writes, the less content they have to learn for the test. Up until the end of June, the content tested is predominantly Grade 11 work and the first term of Grade 12 (Sequences and Grade 12 Trig). This makes the July holidays (4 term schools) ideal to give yourself enough time to prepare properly. Those applying for Medical and Health Science degrees have until the end of the first week in July to write their NBTs. 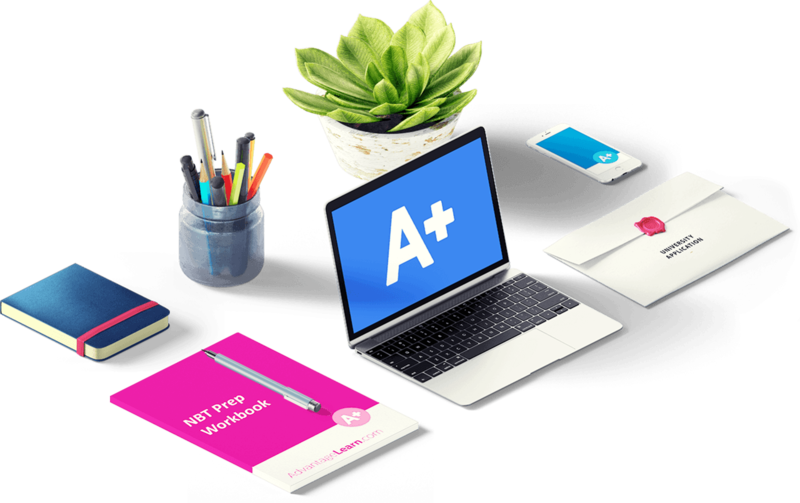 If you are wanting to come to one of our preparation courses, then you should try to write your NBT test about a week later. Time must be given to working through the workbook and AQL modules before writing the NBT test. Where can I write the NBT test? There are various centres across South Africa where you can write your NBT. Click on the following link for a list of all the venue sites across the country. Choose a venue that is convenient for you to get to with this link. Which institutions will use my NBT results and how do they get them? Which institutions will use my NBT results and how do they get them? All the universities to which you apply can receive your NBT results. Many South African universities use the NBTs in conjunction with the National Senior Certificate (NSC) for access to their programmes. The NBTs help to interpret your NSC results and can be used by universities in different ways. When you apply to an institution, they will place your name on their applicant list. As applications are processed, they send the NBT Project a request for scores that match the applicants on the list. Universities will only get your results when they request them. Before you submit your registration to write the NBT, you are asked to check a box giving permission for your results to be sent to the requesting institutions and for your results to be used in research projects. Be sure to read this and check this box before hitting “submit”. Remember, it is your responsibility to check whether your NBT results have been loaded with your tertiary institution. Why do I have to register for the NBT? Why do I have to register for the NBT? The NBT project and the local venues guarantee space and materials ONLY for students who have registered to write at a specific venue on a specific day. A full list of our English NBT open course dates. We also run some of our workshops in Afrikaans. Unfortunately our online Afrikaans courses are under development. This table shows all our "NBT Voorbereiding" workshops which are taught in Afrikaans.